After some research and a little experimenting, Zurora has discovered the new mysterious beans can be crafted to make a... Bean Sprout??? The sprout doesn't seem to be editable, however when placed close to another Goatling their appearance seems to change in a very strange way! Take some beans to Zurora's Craft Shop to see for yourself! An unusual Goatling has been spotted in the Misty Meadows 4 Explore Area. No one knows why he is here, or for what purpose. But for some reason we do know he will leave at the end of the month and his loot WILL retire. March Lucky Number Contest Winners! cacoepy won the Lucky Numbers game (3) with numbers 6, 1 and 2! They won 65600 SS! sunstained won the Lucky Numbers game (3) with numbers 6, 1 and 2! They won 65600 SS! Goatling design submissions for the Design-A-Goatling Decades of Fashion Contest "1930's Fashion" are now open! Entries will be accepted until about April 22nd. CLICK HERE for more details and to enter your design! All participants will receive a special gift inspired by the winning entry. First Place designs will be permanently added to the Appearance Doll Shop. Members can now enter their May/Spring/Sleepy Sunflower & Minions themed designs (and/or nominate other Member Designs) for next months (May) limited edition Battle Center Loot! CLICK HERE to enter and vote for your favs! 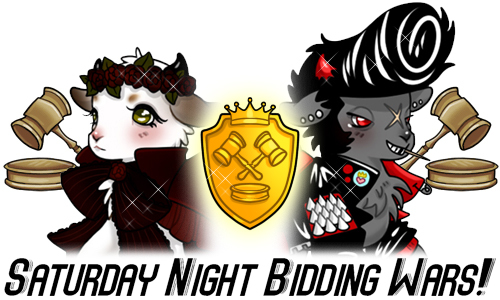 1 Goatling design and 2-3 items will be chosen to add to next months Baddy Loot. Like typical Battle Center loot, these will only be available for one month, then retire forever! Thank you everyone and happy battling! Welcome to Goatling Spotlight! A mini event where we get to show off your favorite Goatlings! Each week a new Goatling will be featured in the News and the owner will receive a shiny Spotlight Trophy to display on their pets page or in their collection. This week is all about Dorothea! Bio: Dorothea is quite the little drama queen - the actress of the family. She owns an ice cream shop, but if you call it anything less than a "gelato parlor" to her face you'll regret it - her pride is legendary. She's always coming up with new, strange flavors, and divides her time equally between her shop and acting in all the latest plays at the theater. She is single and has never had children, but has longed for them most of her life. Instead, she takes care of all her friends' children, and babysits around the neighborhood as much as she can. The Raffle has been drawn. Congratulations to fallow who has won 743000 Sugar Stars!!! 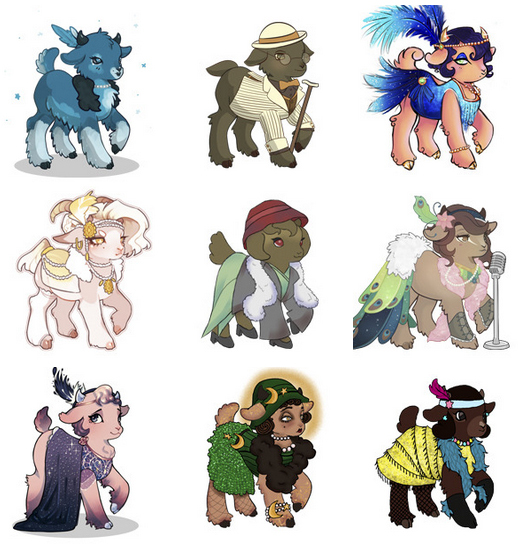 March | Design-A-Goatling Decades of Fashion | 1920's Fashion | VOTE NOW! It's time to vote for your favorite member created Goatling design! Vote by clicking the 'like' button next to your favorite Goatling! Choose wisely because you can't take back your vote. Please only vote 1-3 times. (Top choice, top two choices, or top three choices) In the case of a tie, Goatlings.com staff will cast their votes to determine the winner. Voting will be open until about March 31st. + All participants will receive a special gift inspired by the winning entry. All First Place designs will be permanently added to the Appearance Doll Shop and the designer's name will be added to the item description. CLICK HERE for main event page with details and schedule! Design-A-Goatling Event - WINNERS for Galaxy! The votes are in for the most popular Solar System Goatling! Thank you all for entering so many amazing designs and voting for your favorites! Congratulations everyone! GuernseyGeit's Galaxy design is now permanently available in the Appearance Doll Shop! All design participants will receive "Galaxy Base" for their HA Buddy! This item is now permanently stocked at HA Buddy Base Place. Prizes have been distributed! This is also the last Solar System Goatling from the 2018 Design-A-Goat event! Thank you all for participating!